Manufacturers often claim their cars are most fuel efficient. This is a big factor that attracts a lot of potential buyers towards the product. With the rising fuel prices, people are trying to find ways to reduce the fuel consumption. In such scenarios, cars that consume less fuel come as a breath of fresh air. However, quite often than not, the manufacturer's claim is nothing but a false promise. Cars don't really give what they initially promise, leaving people frowning. The biggest problem is that the victims don't really have an efficient method of calculating the car's fuel. However, this problem can now be solved easily. Given below is a simple method of calculating your car's fuel efficiently. The method is tested and can serve as a genuine proof. Firstly, start your car and go to the nearest fuel pump. Get the fuel tank filled up completely and pay for the bill. Make sure the fuel tank is completely filled to get correct results. To make sure, you can always double check the figures. Once the tank is full, take a look at your car's mileage and record it before even pulling away from the fuel station. Make sure you make no mistake in recording the mileage, as this will serve as the basis for the comparison. If you make any error in recording the mileage, you will not reach the right conclusion. Once you have recorded the mileage, it is time to drive your car. You do not need to be tensed or depressed as you are not required to do any laborious task. The method is very simple and requires nothing but a little bit of attention to what your car tells you. 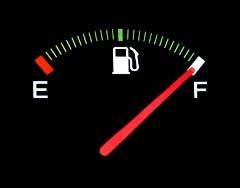 Drive your car for a little while until the fuel tank is half full. You can easily check the fuel level from the fuel meter in your car. Once you have used half of your car's fuel, it is time to stop and look for another fuel station. Always, try not to go on deserted roads where it is hard to find a fuel station. Once you have found a fuel station, it is time to spend a little more money and get the tank filled again. This time again, make sure the tank is properly full. You can double-check to make sure that there is discrepancy. This time, pay attention to how many gallons it takes to fill up the tank. This information is required as it will help you gauge the fuel efficiency. This is usually shown at the pump, and if you cannot find it, you can seek help from any fuel pump representative to guide you about it. Once the tank is filled again, record the mileage properly. Again, make no mistake in recording the figures as any errors will give you a wrong result. Now that you have recorded both the mileages, it is time for simple mathematics. Subtract the first mileage recorded from the second mileage recorded. Again, pay attention when doing this. If your math is weak, please use a calculator to get the answer, which is the number of miles you drove your car since the last refill. The last step, use that calculator again to divide the miles you found out in the previous step by the total number of gallons you refilled the second time. The answer is your car's miles per gallon.